You're going to need a really wide open space to fly this little beauty. We took a few cars out into the middle of Dartmoor to test several of Air Hogs latest releases - all of which we loved incidentally. 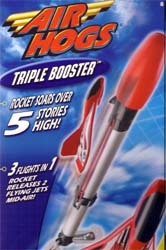 The Triple Booster consists of a rocket and two polystyrene gliders. You must launch the rocket (with planes attached) into the wide blue yonder with the aid of an elastic band style catapult. Once gravity works its magic on the rocket, and it starts to descend to earth, the two gliders are detached and float slowly to the ground - while the rocket sprouts blades and returns safely back to earth in the same way a sycamore seed falls from a tree. A word of warning though. Keep your eyes on where all three objects land (although the planes are hard to miss thanks to the fact they are brightly coloured) otherwise you'll be packing up and heading home early. Also, be warned that if you can get the height with the rocket, the gliders can travel quite some distance if they get caught by the wind. So make sure you are in a wide open space before you even consider launching this. Being a bit heavy handed, I managed to snap the tail off on one of the gliders (easily done when you are trying to stick both planes on to the rocket). The best thing to do - I learnt this the hard way - is to put the gliders on the floor while you set the rocket up. Then you can pick the gliders up individually and place them on their slots. But, even if you do manage to break off a wing, a bit of glue will soon have everything back to normal (check that it is polystyrene friendly first though). This is incredibly good value for money and extremely well made. Of all the Air Hogs toys we have seen in the office, this is by far the best (when you take price, and amount of fun generated, into the equation). 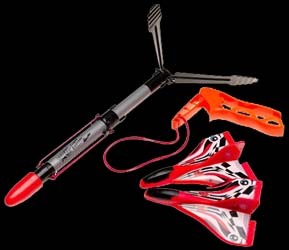 This could well be the most fun you can have outdoors for under a tenner.